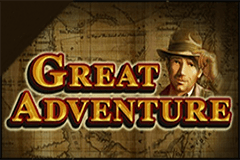 Perhaps inspired by Raiders of the Lost Ark, casino games developer EGT have released the Great Adventure video pokie that has all the ancient Egyptian artefacts that any explorer with a fedora hat and a whip could ask for. Alongside this character, there’s a beautiful female assistant, a notebook and the usual playing card symbols, all landing across 5 reels and 25 paylines and taking players on bonus rounds like free spins with extra wilds. There’s also the option to be a bit adventurous with each win by entering a double or nothing gamble game, and fortunate players can literally hit the jackpot when a random progressive prize is awarded. The Egyptian theme is perhaps the most popular one and is featured in a huge number of pokies, but EGT have given this game a bit of a twist by adding some explorers, so it’s not just the same old symbols of Cleopatra, Pharaohs, and hieroglyphics. It all looks pretty good actually, with a papyrus effect background and realistically drawn images. As all 25 paylines are permanently switched on, there’s a low limit bet of 0.25, although free Great Adventure video pokies can be tried out at many casinos if potential players don’t want to stake anything on an unknown game. The maximum bet is 500.00 per spin, and players win multiples of the amount staked on a line when rows of matching symbols stop across one, on adjacent reels from the left side. Playing card symbols will tend to make up the majority of these wins, as these are the lower value symbols, starting with the J, that’s worth 10, 40 or 100x when landing on 3, 4 or 5 reels, and rising up to the A that pays out 40, 80 or 150x. The treasures of Egypt are up next, in the form of a jewelled beetle and a pharaoh mask, but when we get to the explorer and the girl, we find that only 2 across a payline are needed to win something. Our hero is waiting to pay out some of the best prizes when he swings into action across a payline, rewarding players with up to 1000x the line bet when he appears right across the reels. The top awards however, are paid when his notebook turns up, and this won’t need to be in any particular places to return wins of 50, 250 or 1250x when 3, 4 or 5 land at once. Before the spins start, players will need to select a statue from the 5 shown, and this will reveal how many bonus games they get, which will be anywhere between 3 and 10. It’s not many, so to make things a bit more interesting, there’s wild symbols in play, with any random symbol changing to a golden wild. The free games can be retriggered if 3 or more notebook symbols turn up in a single spin. There’s a chance to double any win of less than 875 coins in an optional gamble game. The aim is to correctly predict if a playing card will be revealed as coming from a red or black suit, and while players get the further option to try and double it again or collect the win if they succeed, of course, a wrong pick loses the triggering bet and anything gained so far in the gamble round. The boxes above the reels contain 4 progressive jackpot values, that range from the small Club prize through Diamonds and Hearts, to the biggest Spade jackpot. It’s a randomly-awarded round, but once triggered, a jackpot win is guaranteed. Which jackpot however, depends on which card suit is first found on 3 cards from the 12 laid out before players. Great Adventure manages to make itself a little different from the usual online casino games in both design and gameplay. One difference however, isn’t that welcome, as there’s no wild symbol in the base game to help complete winning combinations, which seems a shame. The other issue with this pokie is that players could get just 3 free spins when they trigger the bonus games, although it’s slightly off-set by the scatter payout that they would have received when they were triggered, and the addition of wild symbols in this round. In addition, it’s not possible to play Great Adventure on mobile devices. So, it’s not perfect, but anyone who likes the ancient Egyptian theme should find Great Adventure to be an appealing game, with a decent return to player percentage and the possibility of triggering a few big wins along the way.